Lao people are fond of young green mango as snacks food. We like to make sweet chili dipping sauce to go with sliced green mango in the afternoon, sharing the snack with our friends and neighbors while having a discussion about life, Korean drama or Thai drama. 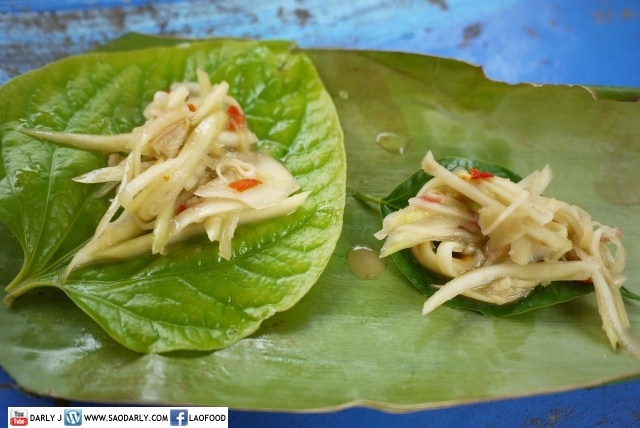 Another great time snack is Tam Maak Muang or Spicy Green Mango Salad. The mango is shredded and turned into a yummy salad using the same method and seasonings as making Lao Green Papaya Salad. The next time you find young green mango at your local Asian grocery store and wondering What to do with it, you can think of two ways of turning it into delicious snacks. Of course, you can always pickle the young fruit in addition to pickling young cucumber.